The UN Human Rights Council has an opportunity and a duty to help Sri Lanka advance its own efforts on accountability and reconciliation. Both are essential if a lasting peace is to be achieved, Archbishop Desmond Tutu and former Irish President Mary Robinson say in an article written to The Guardian today. Tutu, a Nobel Peace Prize winner, and Robinson are members of a group of global leaders known as the Elders, working for peace and human rights. The article adds, “Against this background, and continuing reports of human rights violations by the authorities, we urge the council to support a resolution that seeks accountability for the terrible violations of international law that have taken place, and establishes mechanisms to monitor progress on the steps the government is taking on accountability. If there is insufficient progress by the government in establishing a credible accountability process in the near future, we urge council members to support the establishment of an independent investigation. At the same time, the council should support efforts to achieve meaningful reconciliation, human rights and democratic freedom for all Sri Lankans. Their country is a beautiful jewel of an island, rich in culture, history, resources and human talent. But we fear that if nothing changes, the crimes that remain unaddressed will continue to haunt Sri Lanka’s people and could ignite violence once again. Nearly three years since the defeat of the Liberation Tigers of Tamil Eelam (LTTE) by the Sri Lankan government there has still been no serious domestic investigation of the many allegations of war crimes and crimes against humanity committed by both sides during the civil war’s final stages. These tragic events cannot simply be ignored. A report in April 2011 by a panel of experts appointed by the UN secretary general documented government forces’ large-scale shelling in “no-fire zones” where civilians had been encouraged to gather. Government forces also shelled a UN hub and food distribution lines. The same report says the LTTE used civilians as human shields, refused to allow people to leave conflict areas and forcibly recruited adults and children as young as 14 to fight. Credible sources cited in the UN report have estimated that around 40,000 civilians may have perished in the final months of the conflict.This tremendous civilian toll covers thousands of stories of suffering and strength, the vast majority of which are untold. One verified story chronicles the experiences of a family who were forcibly displaced more than seven times in eight months between September 2008 and May 2009. They repeatedly sought shelter in government-declared “safe zones” (which were then shelled), buried five relatives, including a six-year-old girl, in unmarked graves, and saw many of their fellow civilians killed and injured. While the Sri Lankan government’s own report from its Lessons Learned and Reconciliation Commission, published last December, includes important findings on reconciliation, and represents a potentially useful opportunity to begin a national dialogue on the conflict, it is disappointing in its failure to address seriously accountability issues. The recent announcement that the army intends to investigate its own actions during the conflict is not the kind of independent inquiry that is required. Against this background, and continuing reports of human rights violations by the authorities, we urge the council to support a resolution that seeks accountability for the terrible violations of international law that have taken place, and establishes mechanisms to monitor progress on the steps the government is taking on accountability. If there is insufficient progress by the government in establishing a credible accountability process in the near future, we urge council members to support the establishment of an independent investigation. Finally we want to emphasise that Sri Lanka’s recent history is an issue that concerns all of us. Whether or not the Human Rights Council is able to summon the will to act on one of the most serious cases of human rights violations to have occurred since it was founded in 2006 could have ramifications for the global standing of human rights and international humanitarian law – and for the prestige and authority of the council. srilankan fought against the tamil terrorist,why do not try to bring the peace to your african neighbours,ratherthan fightiing for a one of world ruthles terrorist call tamil tigers. Hay YOU BLOODY FOOL MISBELIEVERS OF GOD in uk.! You jackass folk mind that you’re the f..king evil doers who made this problem by bringing tamils from india to here in the past.! Evil f..king buggers do you now only want to see after 2006..? So who’ll see the crimes done by your grand grand fathers here before…? Then do you feel jealousy as you couldn’t get this beautiful jewel island..? Then what you FOOL ABETS know about mass murders done by tamil ltte terrorists before 2006..? You BLOODY FOOL EVILS MIND YOUR OWN F..KING THINGS till you GO TO THE HELL AFTER DEATH..!!! Srilanka need an inquire o know that How much £ pounds you got from ltte supporters to read this article given by same ltte supporters..! 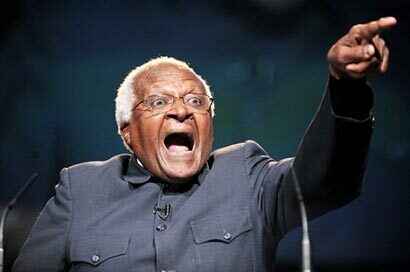 Desmond Tutu had retired from being an Archbishop. He has suddenly been pulled out of the pack of cards, like a trump card, played by the diaspora Tamils, undoubtedly the cunning work of Navi Pillay (fellow Tamil citizen of South Africa) UNHRC Commissioner, on the eve of the UNHRC meeting, when USA is tabling a motion to sanction SL on unverified reports of war crimes etc., on the final days of the Humanitarian Operation in 2009, to save 330,000 SL Tamils held by the abominable LTTE terrorists as a human shield. Tutu had been silent for the last 2 years, now he has been coaxed out of the wood work to put his signature also to a dubious article, most likely the work of diaspora LTTE, which was published in the British daily, The Guardian. Has Tutu ever visited SL, if he was that concerned, since 2009, to verify for himself the truth of allegations of war crimes etc? So many other political leaders, such as US Senators, had visted SL on independent fact-finding missions for themselves. They left totally impressed by the rapid progress in the re-settlement of the displaced 400,000 Tamils and the fast-track development in the N & E. They heard hostages stories for themselves. They realised the truth was, LTTE held them as human shields (a war crime), and when the Tamil civilian hostages made a bid to escape, they were ruthlessly gunned-down by the LTTE on orders from VP, the brutal LTTE leader. About 330,000 managed to escape. But few thousands died as a result of being shot by the LTTE and bombed by suicide cadres, to prevent them from escaping. The Tamil hostages also recounted to the US Senators, that they had been starved by the LTTE, despite the ship-loads of dry rations and water shipped by the GOSL through IRC. The IRC were not allowed to operate within the LTTE camp, where the Tamil hostages were held as a human shield. So the IRC were not allowed to distribute the dry rations and water sent by GOSL. The LTTE used the food and water for their cadres. Some food were distributed by the LTTE to those favoured by them, who did hard labour for the LTTE such as building earth fortifications and dug trenches, against the advancing SL army. The freed Tamil hostages recounted to the panel of US Senators, how well they had been cared for by the SL army, with food and health services. Since the millions of mines laid by the LTTE had been cleared from their farmlands, they had been able to return to their homelands with gifts and finance by the GOSL to re-build their lives, and engage once again profitably in farming and other businesses. Their children are able to attend new schools destroyed by the LTTE, without fear of conscription. New hosiptals replaced the ones destroyed by the LTTE. New infra-structure had been built etc. They are now very happy that peace at last is restored. This is the truth. The US Senators had returned to USA and written a report on what they discovered, which was sent to the US President and published in the media. Tutu knows very little about this. That is why he should have made an independent fact-finding trip to SL, and verified for himself the truth instead of signing a false report drawn up for him by the diaspora LTTE, to be published in the media on the eve of the UNHRC meeting, for maximum effect. As a man of God, how honest to God has he been? It is still not too late for Desmond Tutu to vist SL on an independent fact-finding mission supported by the GOSL, and write a report which is unbiased. As the world speaks, blind SL and its advocates are floundering for a way forward. Roads and hospitals do not bring peace and dignity; they bring rewards in the form of “komis” to many. The UN is about to deal the last crushing blow to tamil nationalism. As Goebbels drums up blabber, the comedians representing GOSL are perhaps having a whale of a time in Geneva. This is the time to show your colours by supporting the downtrodden. The fellow blogger, Nicholas Dias, a catholic, a whimp, changes his colours as it suits him. Remaining ltte supporters are now seeing the last scene in “FAILURE OF tamil national TERRORISM in SRILANKA”…! They’ve got support of these 2 evil ex-men by spending more £ & $ in vain.! But what can they do in sl..? NOTHING..! All of your evil efforts to trouble sl are in vain.! THE MORE YOU TRY, THE MORE YOU FRUSTRATE…!!! Amden has been going strong in the past couple of days. Substance abuse is common among young sinhala males; I hope Amden’s not a victim of that phenomenon. Hilarious daa, fool ltte waste matters..! You’ve depend on many instant Cardboard Bravos like in all tamil films. The Big Bravo pra now in the hell after fed to fishes…! You all are well come to join with him ASAP. The more you try – the more you get troubles…! Look at this 2-2’s report. It is a simple copy and paste job from various web articles. What an ideot? 2-2 you don’t have to try to show your colours. We all know you are “pitch black” and “ugly” like guys who you support. You simply bark and bark without any accountability or responsibility, then your tamil morons may cheer you up, and you collect the money from the side and make sure your retirement life is secure. We look at you comedians (you and tamils) and laugh to our heart’s content. We srilankans have gone Ever Strong till finish & eliminate the tamil terrorism from this country. But now in cool daa..! By the way Nicolas, you mind that this Tutu is the Hilarious Blinded Black God from africa…! He can’t see the suffering africans with his blacken eyes, because he’s blinded by black myth god..! His Eminence Desmond Tutu is now retired. His retirement is supported by the Vatican. Your comments on this great personality in the World of our times is disgusting. I am a tamil and I am used to being referred to as “moron” by the uncouth sinhala community all my life. The sinhala community is what they are; they are uncouth. Your attitude towards His Eminence Archbishop Desmond Tutu is representative of the sinhala people’s attitude towards the majesty of others. Oops.. At last this “parana bar” vomited that he’s as tamil terror supporter.! Hilariously true. So why you terrorist abets hiding under false names..? Because you know yourself that you’re criminal Thieves & can’t face to world at large..! Then the black To tu..! You’re a new born instant blackberry son of god who only sees about till 2006.! Where the hell you were before it..? Were you dumb, deaf & blind before.? Or is that the limit of your black brain..? Or do you stucked by Dollars of tamil terrorists..? All Srilankans heavily suffered from these ltte tamil terror in last 30yrs. Tamil terrorists killed many many countless innocent people despite the nationality. Even they killed ruthlessly the indian prime minister & srilankan president & many other popular srilankans also. They killed 100s of surrendered unarmed policemen & they killed under age student religious priests brutaly by hacking with knives & hitting. There’re no counts in slaughtering murders of innocent families with infants & pregnent women by tamil terrorists.! All these know only srilankans & not you who copy false articles from the net for few dollars.! Then the main source of this problem is WESTERN SLAVE DRIVERS who brought tamils from india to SL as slavers in 100s of yrs ago when UK controlled SL by force. Uk brought about 1500000 poor tamils from india to work as slavers in tea/rubber states made by UK in sl. Then About 350000 tamils had died on the way to hill country of SL because they’ve brought as animals by UK slave drivers. Such uk today talking us about human rights..! Later even india have made an agreement with gosl in 1960s to take back those tamils to india. Unfortunatly it hadn’t implemented as change of politics. Now some of those tamils asking own state in this small island (60k-sqm) while being about 3% in population…! TuTu..! Do you know what i mean..? Would you like more to talk behalf of those tamil terror supporters..? Those tamils who ask TuTu’s help were excited & thrilled before when they heard many civilians died with ltte attacks in srilanka.! Their exciting thriller pra is no more to excite them with killings.! You fool evil tamil terrors are well come to spend more $ to all TuTu’s in the world.! But you never move SL at all..! The more you try – the more will trouble you..!